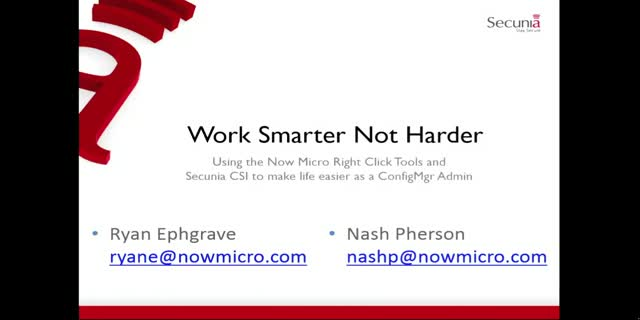 In this one hour session, Microsoft MVP Nash Pherson and Right Click Tools Author Ryan Ephgrave will show day-to-day scenarios that all ConfigMgr Administrators will recognize, but utilize tools that make them easier. These include things like keeping your ConfigMgr infrastructure healthy and happy, taking care of ConfigMgr Clients, and deploying and troubleshooting software updates. Come see the Now Micro Right Click Tools and Secunia Corporate Software Inspector in action!